This ruined circle is beautifully situated on the southwestern slope of Conigar Mountain, in the Shehy Mountain Range. On my visit the circle was very overgrown and an ugly field fence ran straight through the circle. 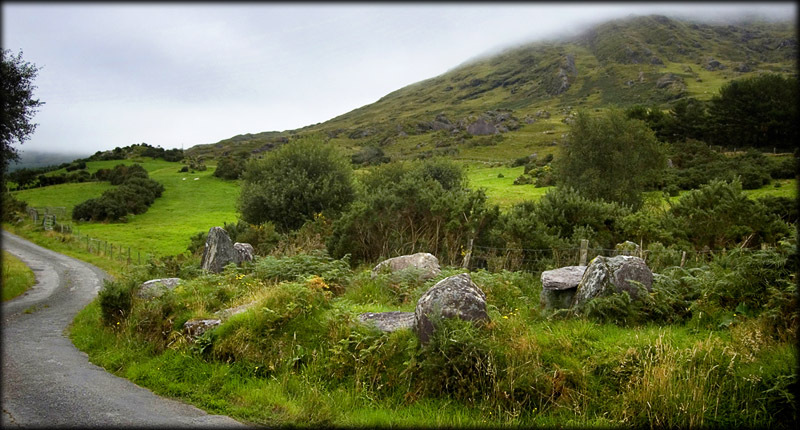 There is a huge quartz boulder in the centre of the circle, a feature quite common in Cork circles. 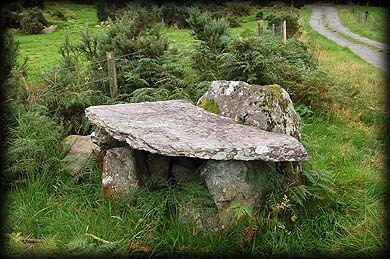 In front on the Axial stone is a box like structure, which may suggest the circle was used like a mass rock during penal times. It was quite misty during my short visit but this added immensely to the atmosphere. Don't be put off by the condition of this circle, it is still well worth viewing. Situated: From Bantry take the N71 north for 5 kilometres, then take a right turn at Dromkeal. Then right at the t-junction, then right again at the next T-junction, followed by an immediate left. Drive for 5 kilometres keeping right at the fork near Knockanecosduff. After 2K take a left in Derrynafinchin and the Circle should be seen by the side of the road on your right. Discovery Map 85: W 0471 6222. Last visit Aug 2008.